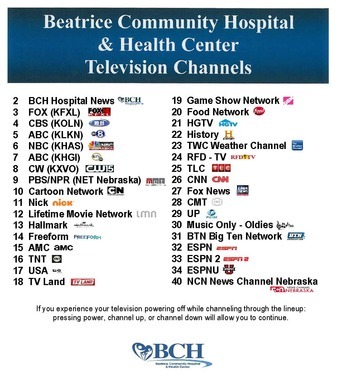 Beatrice Community Hospital offers 35 television channels, including a hospital news channel. Channel 2 is a hospital news channel that provides wellness information, gives news about upcoming events and announces employee honors and achievements. If you experience your television powering off while channeling through the lineup: press power, then channel up, or channel down to continue.